The software update window pops up and tells me this. I’m quite get used to Aperture 3 now, though sometimes I would still mess up the new full screen feature in Aperture 3. 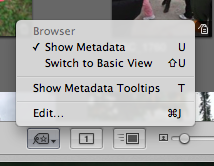 In Aperture 2 full screen – f key always shows you single photo in full screen. But in Aperture 3 which depends on the view of main window. If you’re in browser view, pressing f key will bring you to full screen with all photos like in browser view. It’s happy that Aperture 3 keeps improving. Well, you may criticize why it’s not prefect in the very beginning, but what can be? At least they’ve addressed the critical problems I found. 3.0.1 improved speed, 3.0.2 fixed slow empty trash problem. Hope it’s going to be stable. I’m not looking for any new feature honestly, it’s really good enough or too much. I don’t want it to be another Photoshop, though the new video import, selective editing and curve adjustment are good stuff to replace the need of Photoshop. For loyalty Aperture user like me, the greatest news is Apple finally upgraded the long-waiting Aperture! Before that, sometimes we would feel iPhoto seems more advance in like geo-tagging, face detection, Facebook and Flickr photo sharing. 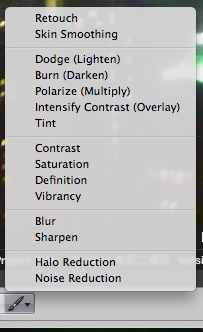 And finally, all these have been integrated into Aperture and makes it double in size. I can’t wait to download the trial version before Chinese new year holiday, but I think as the software I use the most, it’s still worth to upgrade. Just like if it’s one of the most useful lens (hopefully Apple provides upgrade package! ), so why not go ahead and upgrade? Honestly I feel it’s not only large in file size, but also more resource consuming. That’s why we can guess Macbook Pro will be coming very soon! I don’t want to replace my MBP yet. So I guess I will work with both Aperture 2 & 3 a while, and I won’t convert my Aperture 2 library to 3 until I feel more comfortable with the speed. So let’s go deep into the changes I observed! 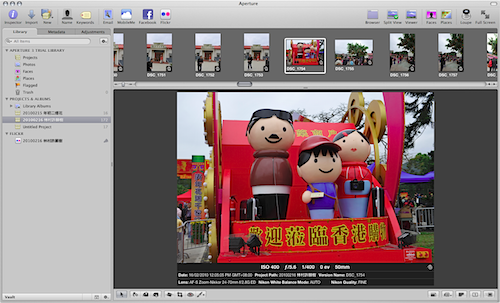 The user interface of Aperture 3 is very like the same as 2, so you shouldn’t have much problem to start including all the shortcut keys you’re familiar with. 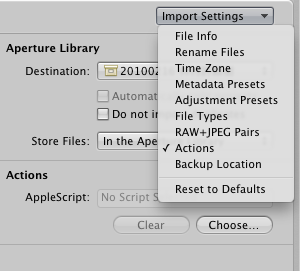 Know how to optimize workspace is the task for any Aperture user. 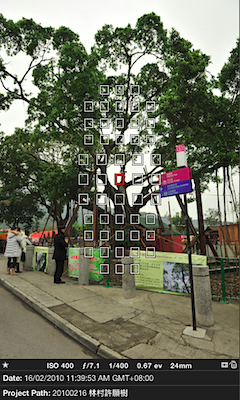 As mentioned, it has Face & Place migrated from iPhoto. 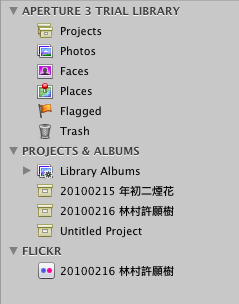 In project panel, it looks very much the same as iPhoto, of cause it supports folder and smart album as before. 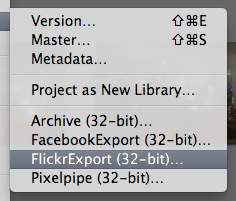 Good and bad, the old plug-in were written in 32-bit, to use them you have to restart Aperture in 32-bit. 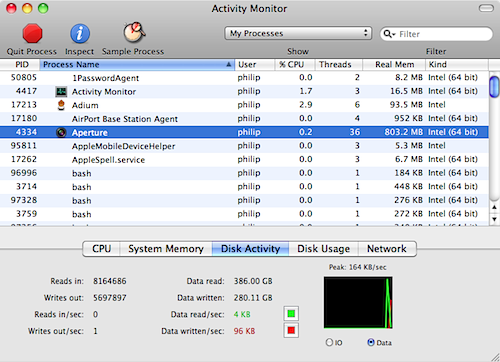 However, I think Aperture 3 can let me eliminate the Facebook and Flickr plug-in from now. Flickr and Facebook synchronization, great! Face, it found many strangers, haha!! My practice is to select my favourite pictures and let Aperture to do the rest to upload the pictures while I’m sleeping. Today I found it didn’t get its job done properly. I checked the Console it has such warning message. And plugins like FlickrExport for Aperture does a great job. And also Facebook Exporter for Aperture. 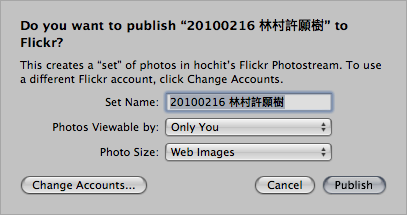 I’m a heavy Aperture user, uploading edited photos to Flickr is always the last stage of my image workflow. FlickrExport for Aperture is always the first Aperture plugin that I need. 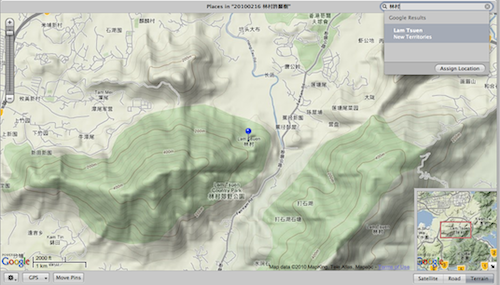 They improved the interface of grouping, ordering and geotagging. They just announced 3.0 upgrade, existing user can upgrade in half price. 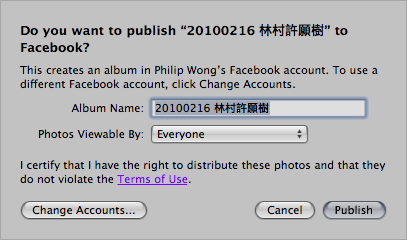 Though I guess Apple may have Aperture 3 with Facebook and Flickr support like iPhoto 09′, I just can’t wait. It also has lite version with limited feature. My “kai” dad found me quite often recently. He wants to get new Nikon D90 and also replaced his Nikon 18-200mm VR f/3.5-5.6 to Nikon’s DX king 17-55mm f/2.8. So bad, he should get mine when I sold mine few months ago. Now he asks me for some sample pictures taken at 17 & 55mm end wide opened. 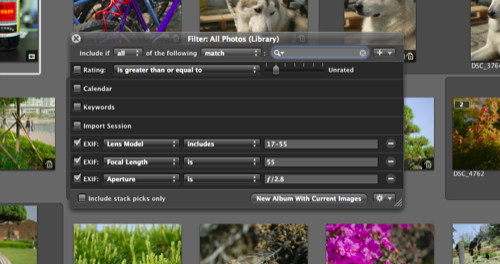 Other than keyboards we would normally touch on, Aperture also provides EXIF, IPTC, adjustment as filtering criteria.